The greatest compliment I can give a camera (or camera maker) is when I double-, triple-, quadruple- or even quintuple-up on that particular camera fearing that I will break, lose, etc. the only one I have. 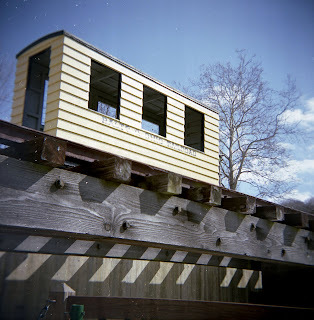 With a camera like the holga (something that is still easily obtained), the desire to double or triple up is not as pronounced as it is with something like the bhf, ultronic panoramic or vistaquest vq 350. Still, if favs are measured in terms of duplicates, I guess for me, in first place would be the bhf (I have 6-7 of them at this point) followed by diana (5 counting mini and clones), holga (4 counting woca and tlr), ultronic panoramic (3 or 4), and vistaquest vq350 (2). At this point, I'd have to add to that list the imperial reflex duo lens. I just bought my second one two days ago and I have to say that if they were cheaper and/or if there were more of them, I think I'd keep buying them up--tough to find them in my price range (i.e., 5-10 bucks). There's not a whole lot out there on the camera, save that it's a simple plastic box 620 camera produced by George Herbert in Chicago in the '50s and that there was a version marked "OFFICIAL CAMERA, Boy Scouts of America." In terms of finding more of these on ebay, it could be helpful to search under boy scouts as well. The camera's other claim to fame has to do with these famous backyard photos. 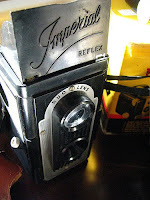 If you search the camera on flickr, you mainly get images of the camera/s and ttv images (see phone image directly above)--as is the case with other tlr cameras that take 620 film like the ansco rediflex. A second thing to know about this camera is that when it says that it uses 620 film, it ain't playing. I have read that others have used 120 but that definitely wasn't the case for me--at least not with the black version. In so far as even trimmed-down spools wouldn't work here, I had to learn to respool 120 film onto 620 spools. A hassle at first but it gets easier after time and I'd say that the extra work involved with respooling is definitely worth it for this camera! A third thing worth mentioning about this camera has to do with the shutter button/release. I wasn't prepared for the way this would look and so I assumed that the button had been messed up or bent back as a result of the seller's really poor packing job. Didn't help that the camera was pretty dirty when it arrived and that the shutter itself only functioned correctly half the time. If, in other words, the camera had been in mint condition or NIB I probably wouldn't have tried dicking around with the shutter release, trying to bend it back into position. YIKES! I thank goodness now that I didn't try harder and bust the shutter release. For what it's worth, the shutter release doesn't look like the releases on other cheap box/tlr cameras. 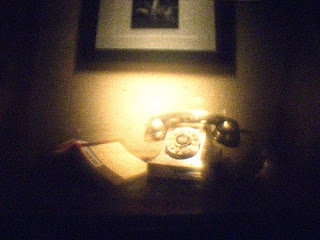 The final thing I'd mention in terms of the camera itself is that it's not the greatest choice for clear, clean ttv work as the very grainy phone image above suggests. 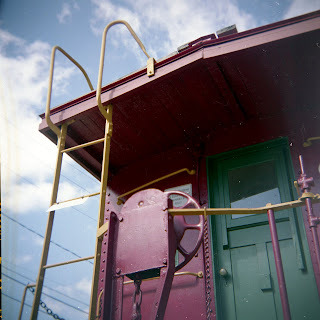 I like the look of ttv images you can get from this camera but it's not the same look afforded by, say, the ansco rediflex. Based on the craptastic condition of the camera when it arrived (by the by, a little elbow grease, windex and wd40 got things cleaned up and working), the graininess of the top viewfinding lens, and how fragile/cheap the camera felt in hand, I definitely wasn't expecting much at all from this camera. Never mind that in order to use it I would have to respool film. 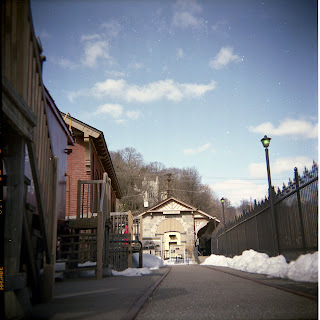 Truthfully, it didn't help that I could find so few film images (i.e., non-ttv images) housed on flickr. This too led me to believe that this would definitely NOT be a camera I'd end up raving about! But here it is: I LOVE THIS CAMERA. If it weren't so fragile, I'd have it with me all the time. (Luckily it does have a neck strap, so that's cool--makes carrying it around easy and there's less of a chance of breakage if it's around my neck.) I think there's only been one other time when I've actually gasped (i.e., in a good way) upon seeing the first scanned-in image taken when testing a new camera. 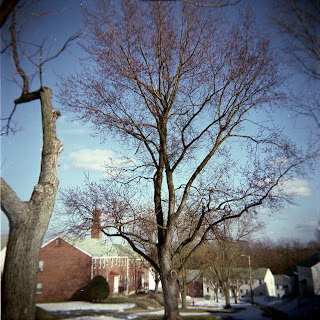 The other time was when I did my first test roll with the ultronic panoramic. I definitely wasn't prepared for those results or for the kind of images that camera can produce! But back to the imperial. I think my reaction to seeing the first scanned-in image was this: "(gasp) How delightfully cartoonish!!" I'm still not sure what that means--to say that a photograph looks cartoonish. I think it might have to do with the depth of focus. Suffice it to say, that I am LOVING this camera. I have a respooled roll of b/w in the camera right now and am eager to see those results. I've consider different ways of rating the cameras I talk about here, such as using some kind of star system (i.e., giving a camera 1 star for fair/poor and 5 stars for excellent). In the end, I think it makes the most sense to treat things in terms of replacement costs. Otherwise put, to rate cameras in terms of how much I could image myself spending to replace them in the case that the one/s I have happened to break, get lost, etc. In this case, I think I'd be willing to spend 45-70 bucks for a working replacement. . .and keep in mind this is coming from a very cheap and definitely not rich individual! Well, technically speaking, this was going to be Thursday's, Friday's or Saturday's project as I've been stuck at home sick. I put the project off, in part, because I didn't want to cut the roll of negatives that came with a lot of expired (and mostly unexposed) film I recently bought. Making matters worse, the negative strip was/is VERY curly, making scanning the images as well as cutting the negatives into more manageable strips really difficult. I have no idea what kind of camera was used for these images. I was hoping to put a rough date to the images based on the type of film used for these but all that appears on the edges of the film itself are the words "eastman" "safety" and "plus x." 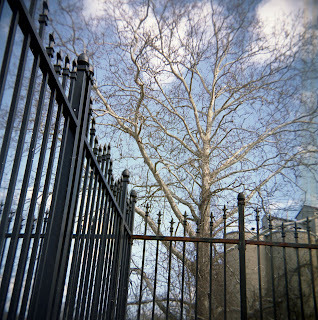 There are (were) 20 exposures on the roll. I had played around with window-scanning some of these images before I got the idea to create a contact sheet for the roll. My first plan was to place all 20 images on a 4x5 contact sheet, keeping the images in the order they appeared on film. As I started scanning in each image, I decided that I wanted to do more by way of interpreting what I was seeing or understanding about these images. I first decided to jettison from the project the two images that were taken with a portrait/vertical orientation, and decided to create the project with 15 images--five rows with three images in each row. 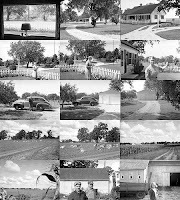 With the first version, the narrative began with what I call "the farm scenes" (see images in the bottom two rows of final version) as they were the first images that appeared on the strip of negatives. The final three images on the strip were actually of the woman in the garden. As I scanned each of the images, I started clustering them in threes, thinking more about how I wanted this visual narrative to begin, proceed and end. At this point, I had decided not to follow the order of the images on the strip of negatives. I debating beginning the narrative with an image (one that doesn't appear here) of the property and the driveway at a great distance. My thought was to approximate visually the idea of driving up to the house, getting a closer view of the house and drive with each image placed in the first row. Then, with the second row, the viewer would enter the backyard, meeting the woman there, etc. One of my favorite images on the strip was the lamp image--the only indoor image on the roll, by the way. (For what it's worth, this is my other fav image from the strip.) I really didn't want to leave this one out of the narrative, so I decided to start the narrative indoors with a through-the-window shot. Following this, the narrative would move around to various locations outside where viewers would "meet" so to speak the people in the images. Technically-speaking, the lamp shot might have been placed before the sequence in the second row since the window appears to overlook what I've (perhaps incorrectly?) been calling the backyard. But because the lamp image is darker than the others (never mind that it appears to be framed), it didn't look good place in the middle of the narrative. My sense was that the narrative had to begin or end with the indoor window shot. And because I really liked the way the final three images in the narrative fit together, I didn't want to compromise that, so the window shot was placed at the start of the narrative. With the first row of images, the viewer begins inside and then moves outside to view the house and driveway. The second row features the woman in the yard. Here I decided to echo the trajectory of the house/drive images--as the narrative proceeds, we get a closer/better view of the woman in the yard. The final image in that row (the one where the woman appears to be holding something up) I also interpreted as a pointing gesture. As though she were saying, "and look who is here." Corny, I know, but it was a way of segueing to the man-with-car image. With the third row, I reverse the trajectory or movement used in the first two rows, using instead the idea of increasing distance and elimination: We see the man and his car, then just the car, then just the drive and garage. With the next row I transition to what I'm understanding to be the other part of the property, beginning with images of the cows and the landscape more generally. I wanted to end the narrative with images of people associated with that landscape or part of the property. I went back and forth on the placement of the final image, of the young girl. I didn't know whether I wanted to feature her right before the image of the two guys (in this way, the narrative would begin and end with my two favorite images on the strip) or place her at the end of the narrative. I chose to end the narrative with her, with her image. I did this, in part, because I liked the way the final image in the fourth row segued into the tractor shot that appears at the start of the fifth row. But I also ended the narrative with her because it is this photo--while not named here as one of my favorites--is perhaps the most haunting for me. Otherwise put, if I could learn more about any of the characters who appear here, I would choose to know more of her story.